Fresh school air, new faces, and a new year of High School. Welcome back teachers for the school year of 2017-18, and a special warm welcome to our newest teacher Ms. Robin! We have a few note worthy words from teachers who have been working here the past few years, and would like to share some words of advice for Ms. Robin. Unlike the tart words that would be received from our students, our teachers choose to come forward with a more mature point of view. Mr. Rodrick, our world society’s teacher, came to work here 10 years ago for his first teaching job and has never left. He started at law school but found that he enjoyed learning and wanted to share that joy with kids. He then attended Pacific University, which is outside of Portland. He is excited to start a new year with new students as well as new opportunities, and has a goal of keeping his students more engaged. He also wants his teaching to be more relevant to his students lives. Before finishing up, we have one more veteran teacher to mention. That being, one of our science teachers, Mr. Gullo. Mr. Gullo has been teaching here since 2006, and is not one bit tired of it. Mr. Gullo loves teaching science, because there is always something new to discover. Outside of school Mr. Gullo loves to run trails and be outdoors. But his favorite time to go outdoors, is during the fall season. He loves fall due to the changing of colors and the transitioning of weather. Finally, to Ms. Robin, our brand new Government/US History/ Leadership teacher; Welcome back to Phoenix High School! Ms. Robin had taught at Phoenix in the late 90’s, and she is now returning home where staff and students feel like family. When she was in high school her social studies teacher sparked her interest in becoming a teacher. Her first career opportunity came around in her 20’s, where she became a youth director for Medford Mid High. After a success in her first career job she then decided to become a teacher. She had taught at Phoenix High School, Hedrick Middle School, Medford Jr. High, and a school in Seattle. Returning, Ms.Robin is taking the opportunity to be this year’s leadership teacher. So far, she loves the hard working and energized kids in her leadership class. Coming to an end, we hope that Ms. Robin feels very welcomed, and our teachers have a smooth and fabulous year. To our teachers from our students, “If you guys can make it, then we can make it!” Thank you for taking the opportunity of teaching, and putting up with us. 1 Comment on "Back to School, Teacher’s Edition"
Great segment! I love staying caught up with my favorite high school! 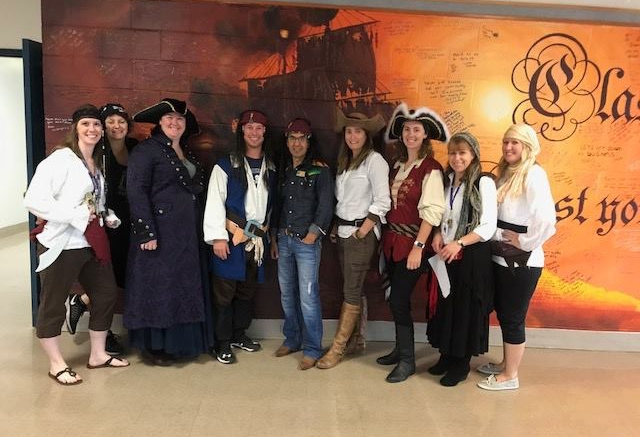 Loved the Pirate group shot. Miss everyone!